The debut of director/writer Kim Min-ho is a crime drama starring the formidable Don Lee aka Ma Dong-Seok (Train to Busan, Champion) and popular actress Song Ji-Hyo (A Frozen Flower) in a nonstop romp involving King Crabs, crime syndicates, human trafficking, friendship, and love. The Korean literal title is Angry Bull and Don Lee embodies that image and woe to those who cross his path. Dong-Chul (Don Lee) and his partner Choon-Sik work various jobs like delivering fish at the fish market. Dong-Chul used to be a gangster but since marrying Ji-Soo (Song Ji-Hyo) he's been walking a straight path. Even though he's prone to getting involved in quick rich schemes like selling hot buns in Africa. Some former friends tell him that he can make huge money in investing in a ship load of King Crabs coming from China. He tries to keep it from his wife because she will freak out when she learns how much he put in on the crabs. Meanwhile some gangsters beat up someone for not paying on his loan, then take his daughter in lieu. On the way back from their kidnapping they run into the back of Dong-Chul's car. The gangsters are acting fishy, and Ji-Soo goes out and adds her two cents. The boss Ki-Tae (Kim Sung-Oh) compliments Dong-Chul on his pretty wife. He beats up his driver and makes him apologize. Then later he breaks into their house and kidnaps Ji-Soo. Dong-Chul goes to the cops, but they don't have much to go on. At the police station he sees a wall filled with young women who have recently disappeared. Later he gets a call from Ki-Tae who tells him to meet him a restaurant. When Dong-Chul is seated at a table that has a suitcase on a chair and a phone. After waiting an hour with food delivered, the phone rings and Ki-Tae tells him the bag of money is in payment for his wife. It's been Ki-Tae's perverse perspective that most people eagerly take the money. Instead, Dong=Chul takes the suitcase to the cops, who make him feel guilty for walking out with the cash. He goes to the crab investors wanting his money, but they said the crabs got seized by the Chinese and they have no idea on how long they will have to wait. Then we finally experience the rage of the bull. 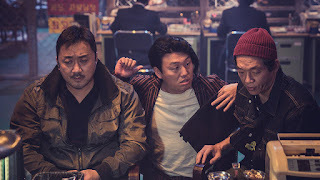 Enlisting the help of a private detective the smarmy master of disguise Gomsagang (Kim Min-Jae), they are able to track down the license plate of a vehicle used in the kidnapping. But the plate was sold by the head of a secret gambling house that deals in nefarious transactions. Eventually they manage to get the information they need thanks to the "Bull". Ki-Tae tells him that he wants his money back and he will give him his wife. The bag of course is at the police station. Don Lee is very engaging as the ex-gangster who is totally in love with his wife. He really wants to do the best thing, but life is tough and the police and business guys just disappoint. He takes action on his own and the righteous justice that he serves is satisfying. His two sidekicks offer the comic relief at the well meaning by totally inept attempts in help out. Song Ji-Hyo gives her character some grit and backbone worthy of being the wife of a ex-gangster. Kim Sung-Oh is so deliciously over the top wickedly crazy. This is definitely worth the popcorn.